Technological innovation is at the core of our business strategy. Developing and harnessing new technologies to better satisfy our customers needs. 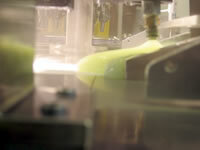 We are a pioneer in hydrogel technology, having created a patented and natural hydrogel delivery system. Gel Concepts has long been a leader in the field of polymers, with a focus on ultra-low and low durometer thermoplastic elastomer compounds. Existing relationships with the top cosmetic houses enable Gel Concepts to quickly bring innovative and patented technologies to market efficiently.